you said it all… let’s hope more and more people get to understand the dynamics involved and the importance of social media in dealing with issues concerning the masses especially when it comes to grassroots organisation. I disagree. “It wasn’t just social media” implies that social media was at least in part a cause of the outcome. It is when used as a refutation to “this is how social media played a role.” It is merely repeating the same content, hence adding none. Thanks for this thoughtful post, and I’m very glad Mona was released and emerged in high spirits despite the ordeal. A few thoughts, hopefully coherent. I’m not easily convinced of the central importance of online communications in general and Twitter in specific in this type of event. There is a strong argument to be made that Twitter was used on this occasion; after all, it all started with a tweet from a habitual user of the Twitter medium. Twitter use was also clearly the mode of coordination for this campaign and effort, and the rapid emergence of this ad hoc organization would seem to have been directly facilitated by the global, instantaneous, and hashtag-able nature of the medium. The trouble comes with the (for me inexplicable) desire to attribute causal roles to concepts like “social media.” A focus on how technology is part of events is a great corrective to ideas that would dismiss artifacts as mere context or setting. The insistence that what we do online is part of real reality and nothing virtual at all is equally important. But the hazard (as Evgeny has often written) of a focus on technology across different kinds of events is that the analyst risks losing her or his loyalty to the event or case itself. One way to think about this is to imagine how the story would be written by someone in your position who happened to study elite political and news media networks rather than technology and society. The story would certainly include Twitter, and it would likely look very similar to the first half of this post, but there would be less focus on the mechanics of hashtag selection. Instead, we might hear more about the counterfactual that you mention about Anne-Marie Slaughter being unreachable. We might hear more about phone-calls to Foggy Bottom and concerns about preferential treatment. This story would also be interesting, but the technology would be a player rather than the whole play. The causal role of friends in high places might serve as the rejoinder. At some point, a multi-causal explanation of a single case just becomes a narrative. There’s nothing wrong with that, but what’s the need for causal rhetoric in such a case? You make excellent points about speed, networks that emerge and operate through online media, and the fact that some things (like “it’s good to have friends in high places”) stay the same. Perhaps, though, the protests that it’s not all about social media come out of an honest concern that more traditional concerns such as power, leverage, etc., tend to escape notice when Twitter becomes a star. Is there not something extraordinary not simply about reaching tens of thousands of potential viewers on Twitter but about the fact that tens of thousands of people all around the world actually care enough to follow distant events? Has the online dissident campaign (thinking #FreeMona, Ai Weiwei, Chen Guangcheng) been part of a shift toward advocacy on heroes rather than on injustice at large, or is there more attention now to these things over all? What is the role of ideological compatibility in which people get this extra attention, for instance comparing a pro-democracy activist who gains support and a land rights activist who gets no such attention despite great ambitions to improve the lot of impoverished communities? I’ve constantly said this, but let me take this occasion to repeat. There is practically no single-cause dynamic worth studying in the world (only the most trivial questions are mono-causal). For everything else, we have a complex mesh I call “networked-causality”–where everything interacts with everything else, all the time. And, there is no method by which you can talk about everything all at once. You must, by necessity, focus, which must, by necessity mean that other things are discussed in less detail. So, what to do? I think the correct path is to incorporate and briefly note other relevant aspects when focusing on a particular element. For me, the test isn’t whether a discussion concentrates on a particular aspect, but whether it is naive/wrong/ignorant of the whole context. 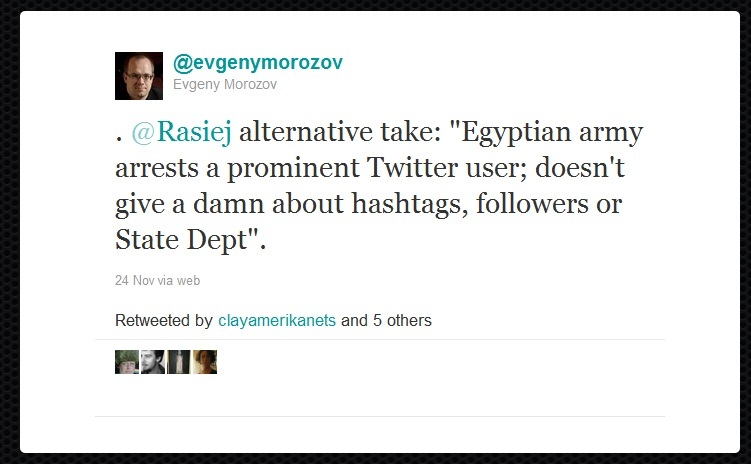 In other words, concentrating on the way in which social media mediated this campaign is fine as long as one doesn’t, for example, ignore the pretty clear role State Department can play in a case like this (which, of course, assumes the US-Egypt relationship) and why this is so. However, as important as it is to understand the *whole* context, I just won’t write 4000 words summarizing the history of US-Egypt relationship in this particular post. Heck, you’d need a book for that–and I wouldn’t even be the person to write that. So, if there is something you think I got wrong about the context, by all means, point it out (and that is how good scholarship advances). Finally, I think it would be great if someone studying “study elite political and news media networks” wrote about the phone calls between Foggy Bottom and whatever they do in such cases. It isn’t, however, an alternative to what I wrote here. Someone should write that (and, they, too, would note that the public campaign impacted their actions) and I will write this aspect. Not either/or. This is doubtless the case for some of this sort of analysis, but certainly not all — some of it is designed to prevent certain sorts of ideas from being discussed. Let me put the position to you as a counter-factual — start by assuming everyone were writing the story by analyzing political elites and news media. What would be an acceptable way of discussing the fact that both those elites and those media well predated the contemporary situation, while some of the forces at play were new? Wouldn’t you have to do what Zeynep is doing, by making her “excellent points about speed, networks that emerge and operate through online media, and the fact that some things (like “it’s good to have friends in high places”) stay the same”? Those very points, it seems to me, are what we need to discuss if we want to discuss change. Anyone who wants to offer an account of what is new in the current situation will focus on the sources of those changes, and that focus may well be required to answer your subsequent questions. 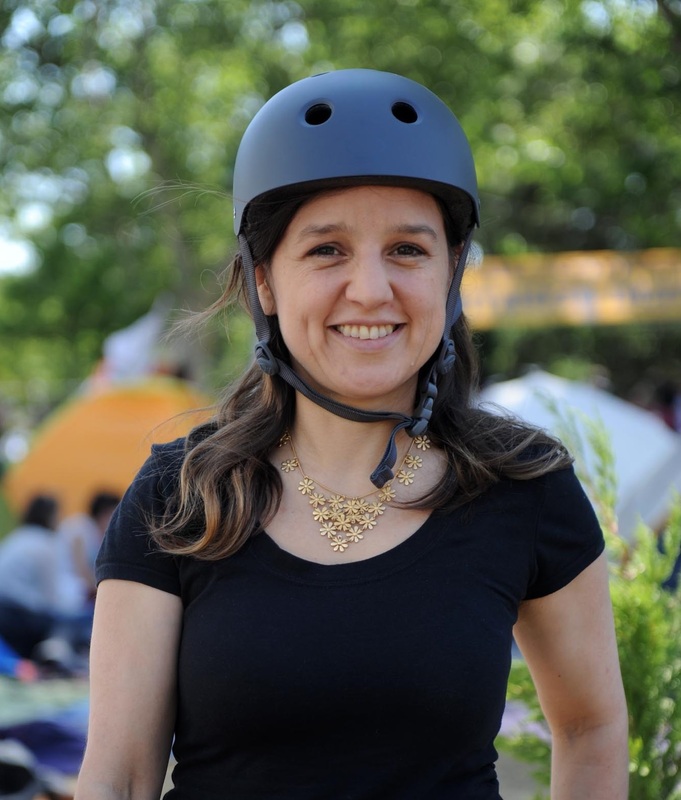 But if you ask that question, you are back to media and novelty, and, in particular, to Zeynep’s earlier observations about how present a twitter stream feels, so that it feels odd to read news of tear gas in Tahrir and then someone’s observation about a new restaurant. This sort of juxtaposition happens in newspapers all the time, but doesn’t feel odd the way it does in twitter. But you’d have to discuss why that is, which is to say discuss the difference between older and newer media, even to answer your question about distant events. And sometimes you have to do this to get at the bottom of other, related questions, like what makes an event like the current Tahrir uprisings not seem so distant. Thanks for this, Clay. As you note, I am writing about a particular transition here. I am not sure what anyone would get out of it if I wrote 10 pages about how “it’s good to have friends in high places.” I try to note such obvious, well-understood facts and, instead, try to understand, well, what happens if you can reach your friends in high places using a new kind of medium such as Twitter, and coordinate how you contact, say, the embassy in two separate countries using social media. Here I am in agreement, but the debate is about the boundedness of “sometimes.” Specifically if the goal is to understand causality, the entire question is which times do we need to talk about what? Social science has a tough time with causality. First, it must attempt to overcome the lack of real experiments, as Zeynep mentions. For large-N research, substitution of old for new media practices can be one variable among many, and some sense of partial causality can be claimed with precisely stated confidence. With few cases, we are left to argue causality and gather suggestive evidence. Comparative case studies can propose accounts of what happens with or without a given factor (say social media), but they are vulnerable to serious flaws from selection bias. The second problem is more fundamental, in my view. Social events will rarely have a discrete single cause, so muti-causal models are necessary for understanding. If you have sequential causality as the question (i.e. what factors A, B, C, … N caused condition Alpha), then the question becomes both what caused the event and what caused more of it. A more situational causal model such as the “fuzzy set logic” used by Charles Ragin and recently by Phil Howard allows for a combinatory logic on the “independent variable” side of the equation. But we’re still left with: Was it more important that Twitter was used here, or was it more important that Mona and Zeynep and others had influential friends (say, “social capital”)? Here is where I think the constant argument over “technology was important” versus “other stuff was important” is a tired false dichotomy. If we’re focused on tech, however, and case selection is based on technological variables, it is extremely important to consider controls for other factors in the literature on mobilization, movements, elite politics, etc. At least, this is necessary to meet social science standards (such as they are) on causality. By no means is it bad to tell a story about media, but the debates are about causality and not about whether media use matters. I obviously think it does. To most fully tell a single-case story, though, a wider variety of “if not for X could Y result” counterfactuals need to be considered to pacify skeptics about any one claimed cause. Graham says: “First, it must attempt to overcome the lack of real experiments, as Zeynep mentions. For large-N research, substitution of old for new media practices can be one variable among many, and some sense of partial causality can be claimed with precisely stated confidence.” — Well, no, not really. There is no “old” unmodified by the new anymore. Old and new coexist in a new reconfiguration. No easy way to compare them. Third, I wrote about this case not to tell a story only about media but a particular case which illuminates how new pathways of connectivity alter dynamics in an age-old question: what determines how an authoritarian regime treats a particular dissident? In this case, a somewhat famous one. 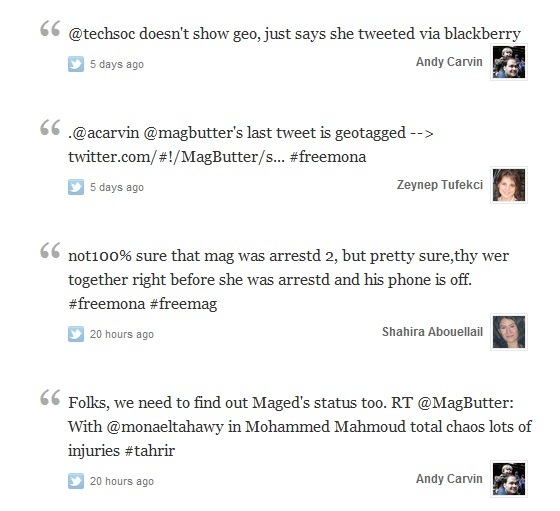 I think Zainab Al-Khawaja’s case which broke right after this one is also fascinating (@angryarabiya on Twitter). Hope I can find a moment to write about it. You’ll note I went to some length to explain some of the classic problems people not familiar with this kind of human rights work might not understand (the different threats posed by the low-level functionary, for example, versus the knowledgeable authorities). I find little objectionable about the original post here, something I’ve tried to make clear. My initial questions were motivated by a desire to explore why it is that some people object to social media–centered account of political events and to what extent those objections might be minimized by a shift in rhetoric to one in which multiple explanations are considered and their relative weights are explained. In essence, my remaining question is: If there is no such comparison as new and old, how can the emphasis in an explanation center on the new? I would argue that a changed “media environment” could be discussed. Consider two time points, 1990 and 2010: In 1990, there were newspapers and televisions and telephones, and satellites were coming into more common commercial use. In 2010, all these existed but had changed over time in terms of reach, modes of use, and core characteristics. 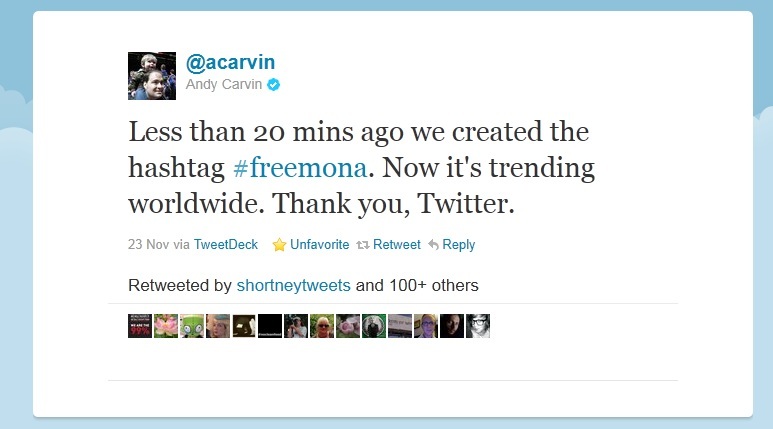 Meanwhile, new technologies were added to the mix, among them widespread mobile phone use and Twitter—both obviously critical for #FreeMona. What is the problem with saying the media environment might be a factor and that it had different states at different times? As for the question of social capital formation being related to media, I agree that these questions are inextricable at the deepest level. For causal reasoning, however, phenomena need to be delineated and their relationships need to be described in order to make more explicit the model-creation that occurs in our minds anyway. Without some delineation of potential explanations, the question of what “determines” a particular outcome becomes simply a description of events as recorded. Description is great, and it’s often more illuminating than the competition of models made of variables or of existing social theories. But when it comes to causality, description alone loses its teeth logically, because the potential always exists for gaping holes in the narrative. Historical methodology deals with this by less systematic evaluation of competing explanations and the continuing process of bringing new sources to bear. Social science is based on the idea that a formal situation (such as “treatment of a dissident by authoritarian regime”) can serve as a framework to compare cases. If the dissident situation can be abstracted, why can’t the multiple explanations? In sum, I’d like to learn more about how you conceptualize networked causality, and I apologize if you’ve written volumes about this that I’ve completely missed. But at root I really wonder if causality need be the goal. As before, thanks for a great discussion. I think we’re missing one simple, fundamental piece of critical information in the flow here, which is the contact of the US Embassy. 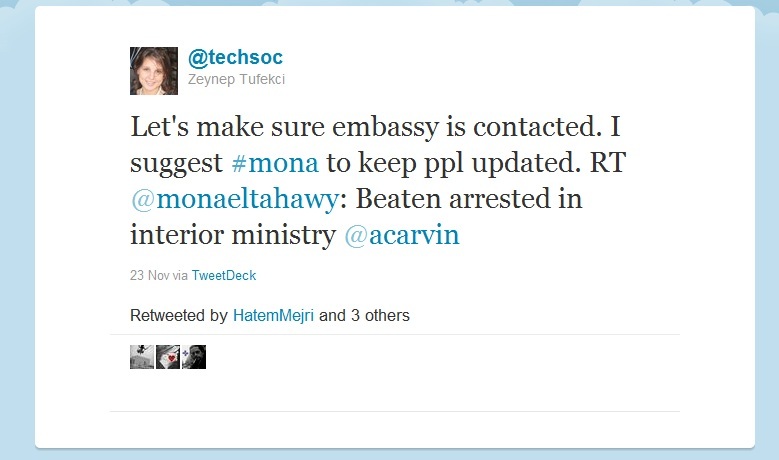 In the current political situation in Egypt, it is probably reasonable to assume that concerted pressure from the Embassy contributed to the speed of Mona’s release. Had she not tweeted herself, and had their not been a flood of calls to the Embassy, I’m almost certain this direct pressure would not have been exerted so rapidly. Thus, it’s not about Twitter, it’s about the content getting out to the right audience in a timely manner. What Twitter does is shorten that cycle. Could it have happened without social media? Sure, but it would have taken much longer. How can it also not be about Twitter if, as you say “Twitter shortens that cycle”. That’s exactly my point. Faster is different. Saw your excellent blog post and wanted to add some comments based on my experience …. After years of research, social scientists presented their final conclusions on the question “Does television affect children?” Their answer: Some children; in some conditions; some of the time. Chaffee said that in his experience after decades of work was that his Stanford colleagues and others had asked the wrong question. The research question should have been: How does television affect children? Completely agreed. I have seen so many serious people claim that Television doesn’t impact everyone. For me, such statements don’t even pass the laugh test. What they mean is that there are no methods by which we can conclusively measure the precise impact of television on every single person and separate that impact from every other factor out there. Excellent discussion as usual that explains a lot. You say that there is no way to scientifically set up an experiment in the social sciences (artificially anyway) in order to test hypotheses, but it must surely be the case that history or events sometimes offer us controlled/semi-controlled experiments – not on purpose, of course, but that they just happen. – and what their respective outcomes are. And by “connections”, I mean not just connections to powerful people, but powerful people who actually are in a position to put pressure on the particular police/military forces detaining an individual, either diplomatically, or otherwise. 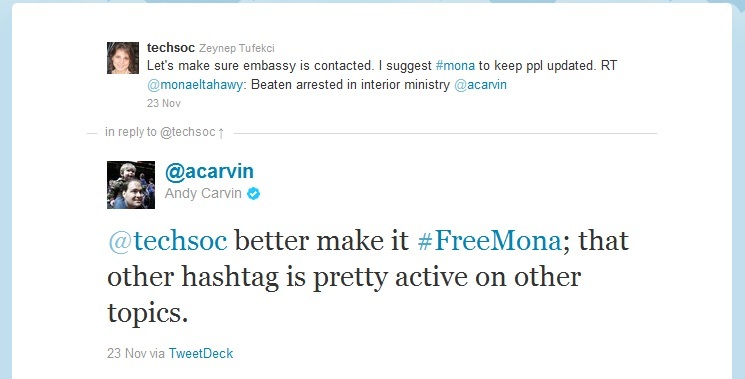 I believe in the power of social media and agree with just about everything you say here, but I suspect that Mona’s notoriety and connections to the State Department had more to do with her actual timely (fortunately) release than did the social media surrounding the event. 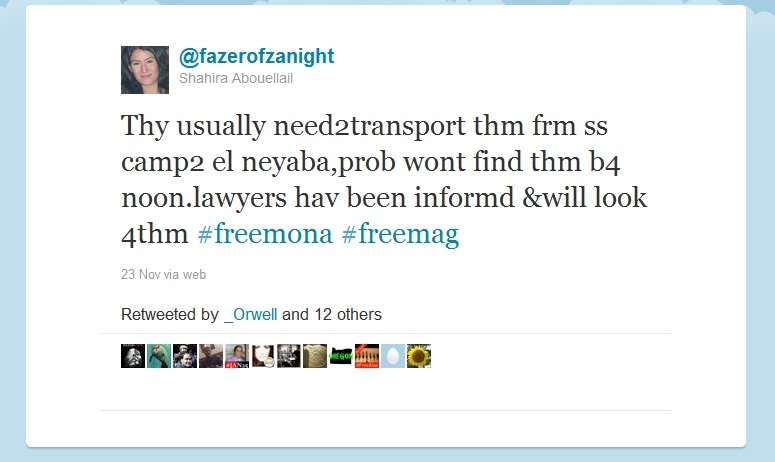 That is to say, the fact that someone probably well placed to put pressure on Cairo was contacted and the word was spread was secondary to the fact that this person (Embassy, etc., or persons) were actually able to put pressure on Cairo in the first place – and the fact that the police forces (or govt, or what have you) reasonably expected to pay a price for their behavior. There is also the corollary that it will work better not only for prominent people, but moreover that prominent people who are Tweeting or writing about such incidents will also receive more attention. i.e., if there were not people like you writing about it, the reaction (if there was one) from the Embassy, or State would have been more tepid or nonexistent. How many other people are languishing in prisons around the world that we don’t hear a peep about? Lots. To do establish conclusive causality, you need the same person, same police with and without notoriety and with and without connections. Back to the no alternate universe, no time machine, no cloning technology problem. Yes, comparative work is VERY helpful but it is not conclusive in the sense someone can always point to an intervening variable which makes a difference besides the ones you are interested in. My claim is there is no separating the “social media surrounding the event” from “Mona’s notoriety and connections to the State Department.” Her notoriety is completely intertwined with social media and the way State Department acts is not independent of the campaign, etc. It is all one big mix. I cannot answer “which of these was more important” because the “these” are not separable. Agree with your corollary to the degree I understood it correctly. Yep, there are many people languishing in prisons without a peer. I hope to write more but this kind of “protection” of sorts we are witnessing for a few “micro-celeb” activists is, almost by definition, going to somewhat protect only a few people because the whole point is that they can garner a lot of attention in short period of time. It’s simply not going to work for large numbers of people all at once. While it is still pretty significant that such a class of people have emerged; by no means is it even remotely sufficient. – Yes, but they are clearly two different concepts/ideas which we can sort out mentally and talk about, even if there is no real precise way of measuring them. It is still possible to ask the question. It is possible to envisage vibrant and active “social media surrounding the event” without any State Dept of official involvement, and with no action being taken whatsoever to remedy the situation. I guess what I am trying to say is that social connectedness (whichever ways you have of measuring this) or “celebrity” status does not necessarily mean : power to change one’s situation, or destiny, necessarily. I understand better your point though, that with complicated networks like this it is extremely difficult, even impossible to totally isolate any one aspect, as they are all interacting simultaneously and all affect one another. As for the broader question “Do social media tools affect social movements”, I agree that it is a pretty meaningless question – of course they do. Graham, we are obviously mostly in agreement. Not only are social events not mono-causal, in other words, the causes aren’t even separable or renderable in any orthogonal way. As Bruno Latour is fond of asking “In which building is ‘social capital’ produced?” There is no way to adjudicate the question you are asking above, if social media alters the way social capital is traced and acted on. New technologies make new outcomes possible (anything that fails to do that either isn’t technology or it isn’t new), *and* tools are used by people. Like a Nekker cube, you can look at the way networks of people approach new problems, with the tools included in the narrative as a means of effecting certain outcomes, or you can look at the way tools alter the way networks of people get things done. However, also like a Nekker cube, you will never be able to make one or the other of these narratives finally express itself as the really real one. As you note, Clay, we are broadly in agreement on this. 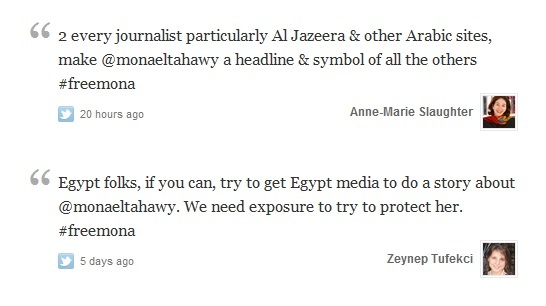 I agree that Zeynep’s account was not mono-causal; it was explicitly concerned with the complexity of the matter. As I’ve noted above, I do think there is a question of emphasis. The reason I noted the “tired false dichotomy” was that, despite all discussions, we still have people behaving as techno-enthusiasts and techno-skeptics. I’m in an odd position here, because I think technology is extremely important, but I often feel scholars and journalists on this question lose some force by making tech the center of a given story. Here, I have to say this is a mischaracterization of my argument. As I put it originally, I was talking about people arguing about one thing being “important” in a narrative. This is because I think determinism and causality are specific problems of their own, and the argument was about emphasis. So, it’s true that someone who thinks technological determinism and social constructivism could not occur at once would fail to account for the role of technology in social processes; I just didn’t claim that. So, in essence I think we come out even more in agreement, if not having resolved the question of tactics regarding discussion of technology’s importance in the context of social and political processes. We can be thankful, at least, that blogging technology affords us the opportunity to discuss such things over a holiday weekend and without ever having met, and that we’ve chosen to avail ourselves of this affordance. Pingback: Do solidarity campaigns really help bloggers?